Years ago, SSCI pioneered the original volunteer management and background screening program of the National Recreation and Park Association, called Operation TLC². Today, as NCSI | SSCI, our company has expanded our commitment to serving more than 3,000 parks and recreation agencies across the country. 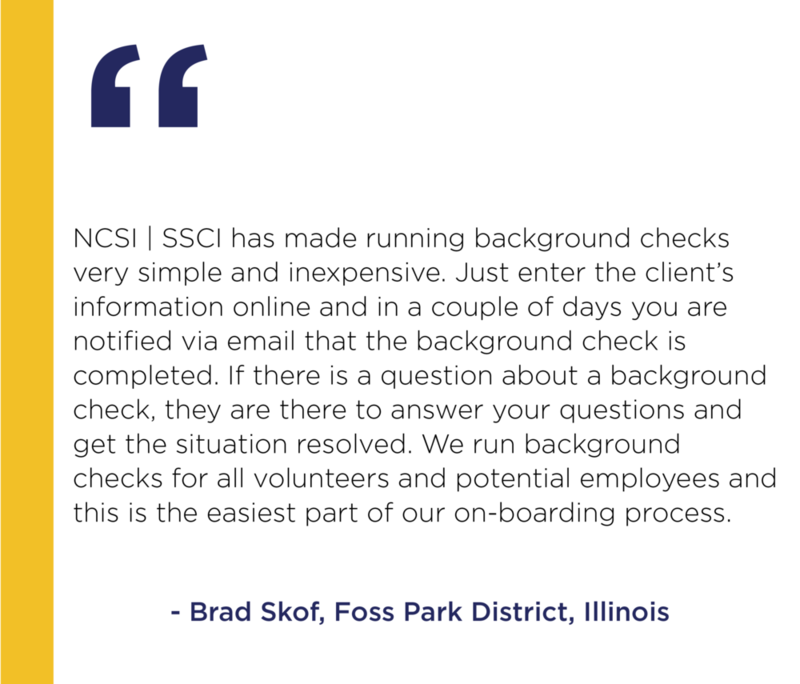 Built with a focus on helping Parks and Recreation Agencies protect their communities, our volunteer and employment background checks are designed to meet the unique needs of cities and counties who rely on volunteers for their programs. 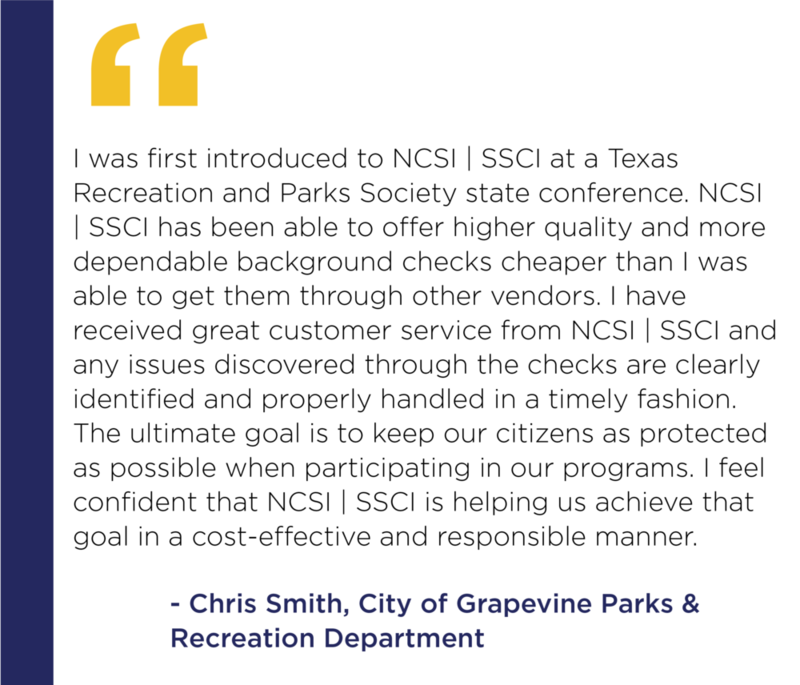 The NCSI | SSCI Guidelines were set in place to help Parks and Recreation agencies conduct the most comprehensive and rigorous background check available. Our goal is to help organizations like yours keep children safe which is why our National Criminal Background Screening Program uses multiple forms of identity verification and hands-on courthouse research to ensure the most accurate results. Why is NCSI | SSCI more effective than other providers? NCSI | SSCI goes beyond a national database for an in-depth investigation that most providers do not offer. If the cost of the background check is $15 or less or the results are instantaneous, it is most likely a database-only screening. Database-only checks are substandard in the field of Parks and Recreation and do not meet the test of due diligence in the court of law. What is a child’s safety worth? This program will save you time and money while offering you more coverage. 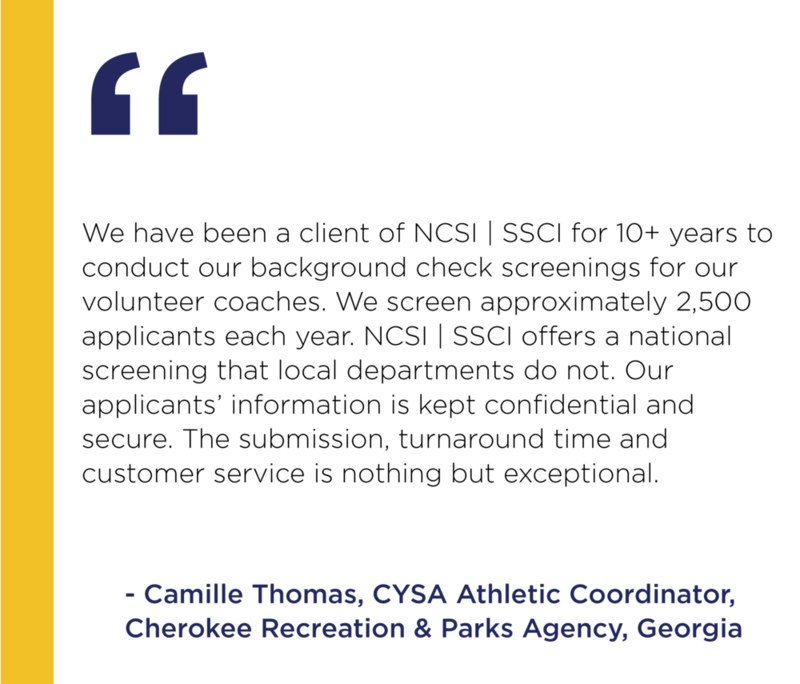 NCSI | SSCI is America’s # 1 Choice in Parks and Recreation Background Screening and has set the background screening standard which has been adopted and implemented by over 3,000 city and county park and recreation agencies, countless youth sports organizations, and most of the National Governing Bodies of the United States Olympic Committee. NCSI | SSCI is also a Founding Member of NAPBS and is responsible for constructing the NRPA Background Screening Guidelines. We offer competitive pricing for our all-inclusive screening package which contains no membership fees, hidden costs or annual minimums. RecTrac clients and their authorized user groups can also take advantage of our online sign-up option with self pay. NCSI | SSCI is able to offer this feature through our unique partnership with Vermont Systems (RecTrac). Are Sports Associations Using Your Facilities? If youth sports associations use your city or county’s facilities for their programs, you could be liable if the proper background checks are not performed on their coaches and volunteers. NCSI | SSCI can help you to gain control of these Youth Athletic Groups and Leagues (also known as User Groups) by offering a unique background screening package for coaches and volunteers, specially tailored to meet your needs. There is no limit to the number of Leagues or Youth Sports Organizations (YSO's) you can manage within your system. There are no maintenance fees or start-up fees and you only pay per background screening that is added to your online management system.